The White Elephant restaurant has been open for business for exactly one week - but there hasn't been a single customer yet. When one finally arrives, it causes Gordon the chef to get his knickers in a twist. Learn this and other expressions connected to panic! Welcome to The White Elephant - the restaurant with no customers. 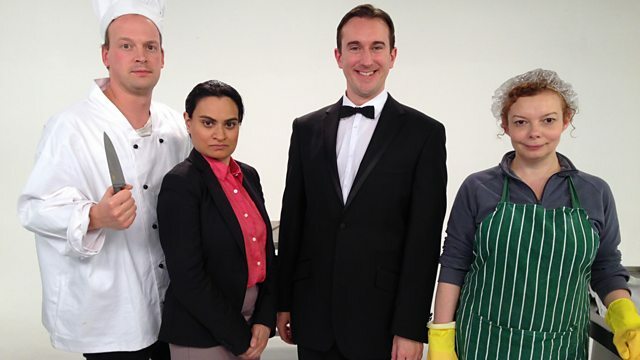 Gordon the chef thinks he's a genius, Peter the waiter is clueless but eager to please, Ceilia the manager is desperate for success and Mary the dish washer is cool and calm under pressure. How will they cope when someone finally comes for a meal? What? A customer! Are you sure? Yes. He's in there sitting down. Well, what does he want? Chill out! I think it would be a really good idea to go and ask him. He wants a hen's egg instead of a duck's and… potato fries instead of polenta fries. What?! So he wants egg 'n' chips. I have not worked in some of the world's top restaurants to end up cooking egg and chips!. Gordon, Gordon keep your hair on! Customer's is always right – and thank goodness we've got one. So, let's try to keep him happy and - who knows - he might bring his friends next time. Don't get your knickers in a twist Gordon. Look, why don't I go and speak to him and see if wouldn't rather have Gordon's duck egg and polenta fries. You can download the drama from our Unit 1 downloads page. Don't panic! It's only a quiz. How much did you understand in The White Elephant: Episode 1? Check the first few lines of the transcript. How many customers had visited The White Elephant before the one in this episode? Why doesn't Gordon want to cook egg and chips? Mary tells Peter to 'chill out'. Why? You can find our other BBC Learning English dramas on our Drama page. How long will it be before Gordon gets to cook a meal for a customer? Join us next week for Episode 2 of The White Elephant!